This is one of the statistics released by NRS’ Organization of the Month for February 2018, Break the Cycle (BTC). As one of the first organizations focusing on teen dating abuse prevention, Break the Cycle’s mission is to support young people in building healthy relationships and creating a culture without abuse. In an effort to promote awareness, BTC created Teen Dating Violence Awareness Month, now known as Teen DV Month. According to their website, it is a national effort by activists, community leaders and national and local organizations, to raise awareness about dating abuse, promote programs that support young people, and encourage communities to prevent this form of abuse with the goal of decreasing the prevalence of dating abuse among young people. This campaign occurs every February. Break the Cycle was started in 1996 in Los Angeles, California to fill the gap in services for young people experiencing abuse in dating relationships. According to Loveisrespect, each year, nearly 1.5 million high school students in the U.S. experience physical abuse from a dating partner. BTC helps youth by encouraging them to speak about dating abuse in their schools and communities. They offer training and workshops to equip communities to support youth in healthy relationships. They provide legal services for survivors and advocate for legislative change to protect the rights of young people at the state and federal levels. 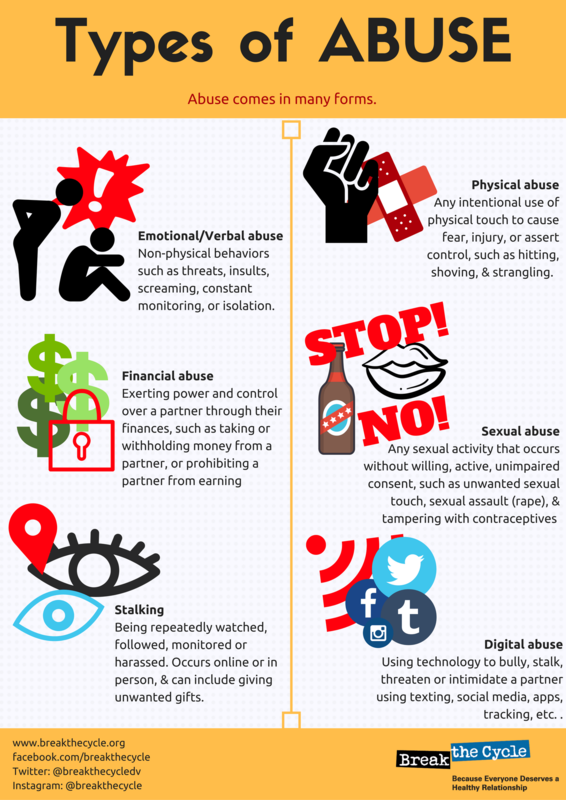 The BTC website offers many tools and resources for youth to identify abuse and understand their legal rights. Their website also provides significant statistics on dating abuse. For Teen DV Month, youth and adults alike can participate in “It’s Time to Talk Day,” meant to generate conversation about healthy relationships and preventing teen dating abuse. Youth can also use art and their creativity to participate in “Chalk About Love.” Youth share community messages of support and love with a piece of chalk and a section of sidewalk. Break the Cycle is one of nearly 7,000 resources in NRS’ database. BTC provides the support that youth in crisis need to escape from abusive relationships and educates others to avoid abuse in the future. NRS is proud to be a partner in the mission. Information on Teen DV Month, along with resources and how you can participate are at BreaktheCycle.org/TeenDVMonth.